3 piece chromoly design that can take non stop abuse - 100% Chromoly - Sprocket boss for regular and..
MATERIAL 100% 4130 Chromoly FEATURES 175mm | 420 Baked rectangular arms | Bossless .. The Cult "Crew" BMX Crank is a well elaborated crank from Cult. 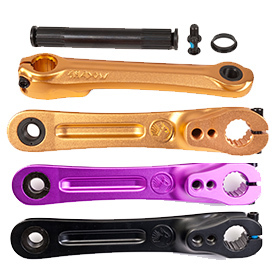 For saving weight it has hollow flus..
HAWK CRANKS The Hawk 22mm cranks are fully heat-treated and feature 4130 chromoly crank arms made w.. The Fly Dolmen cranks are the first cranks to feature a one piece invest cast pedal boss which means..
Material 2 piece crank set. Full heat treated 100% 4130 chromo – RHD/LHD compatible. 2 sprocket.. The Calibur Cranks are Odyssey's new “traditional” 3-piece, 4130 chromoly cranks. With all the hardw.. The Thunderbolt cranks are based off of the popular Odyssey Twombolt design. The arms are incr..
2pc crank set designed for strength and weight savings. The Twombolt is made from 41Thermal ch..
2pc crank set designed for strength and weight savings. The wombolt is made from 41Thermal chr.. Replacement spindle for Primo Hollowbite crankset. Made of Titanium to shed those unwanted pounds.&n.. Replacement spindle for Primo Powerbite crankset. .. Replacement spindle for Primo Powerbite crankset. Made of Titanium to shed those unwanted pounds.&nb..
replacement bolts for Primo Hollow Spindle (Powerbite/Hollowbite) ..
Spec: Includes mid 24mm BB kit Crank Arm Length: 160mm, 165mm, 170mm, 175mm Drive side: RH.. The Superbite is a modern reimagination of the classic Powerbite designed in part with team rider Co..
4130 trapezoid heat-treated tubular chromoly crank arms 3pc design with 19mm 48 spline heat tr..
Rant Banging 48 Spline replacement spindle..
Rant Banging 8 Spline replacement spindle..
Trey Jones Signature Crank 4130 chromoly custom forged tubing Custom investment cast oversize sp..
Seth Kimbrough signature cranks 7050 T-6 alloy arms with dual pinch bolts, LHD / RHD compatible ..
- 4130 Sanko chromoly- Micro drive and right / left hand drive compatible- 19mm spindle- 100% post w..
Budget 3PC Cranks from Stranger called the Level Cranks. These Level Cranks are the very Cranks Stra..
he Stranger Mass V2 Crank features an updated 2 PC version of the original mass crank with a custom .. The Saker Cranks are designed to be an affordable 3-pc crank with tubular chromoly arms that have a ..